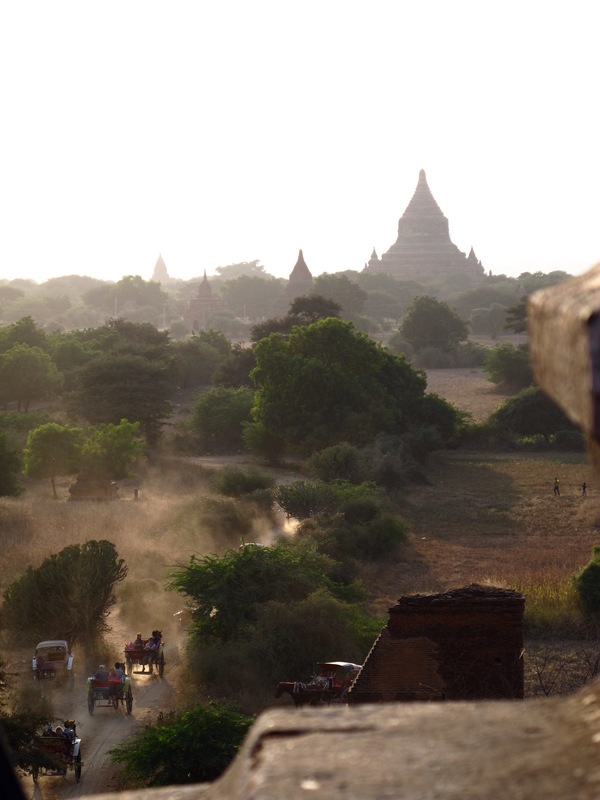 Rather unsettling seeing this raw, dusty landscape dotted with innumerable 11th to 13th-century stupas and pagodas of various heights, sizes and designs. 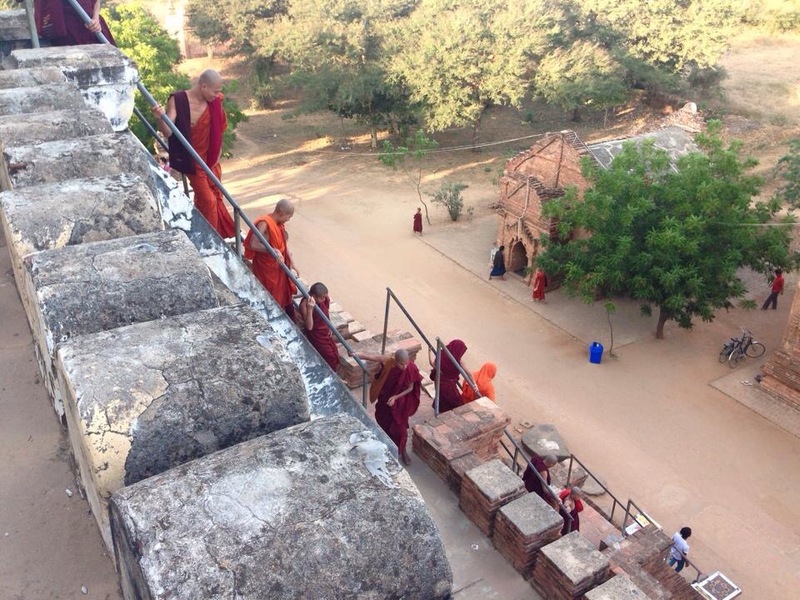 Buddhism truly thrived and flourished in this former province of British India. 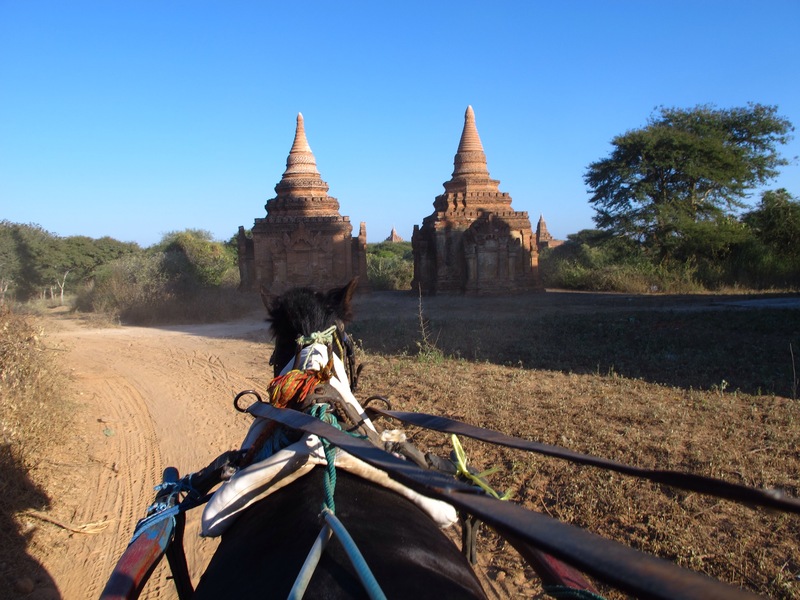 The moment we spotted a cluster of about 3 or 4 ancient stupas, we wanted to jump out of the bus and snap away with our cams. 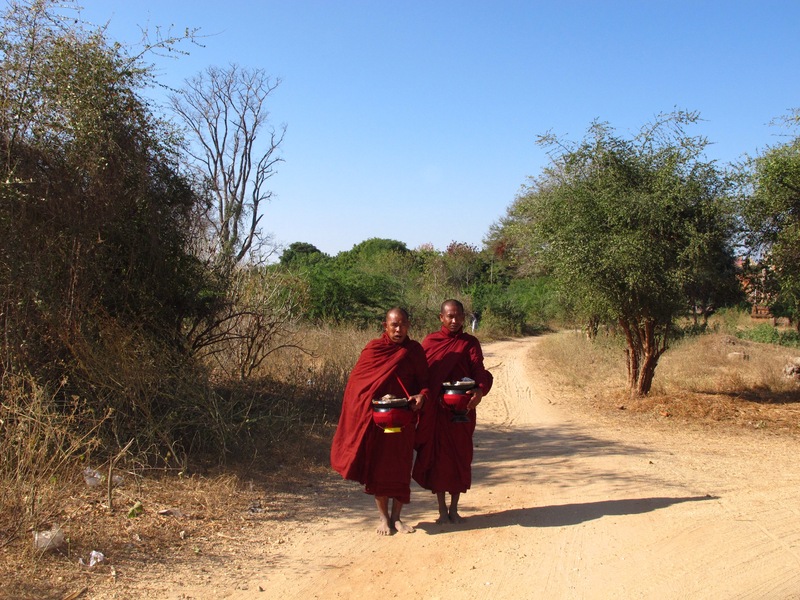 My, we felt like some time machine transported us to this vast Bagan Plain where some 13,000 religious monuments once stood. Of the remaining 2,200 monuments in this 42 sq. km. earthquake zone, we can only surmise that only a few prominent ones are visited and upkept. The smaller ones seem to be cared for by local families enterprising enough to sell trinkets and artworks beside the monuments. 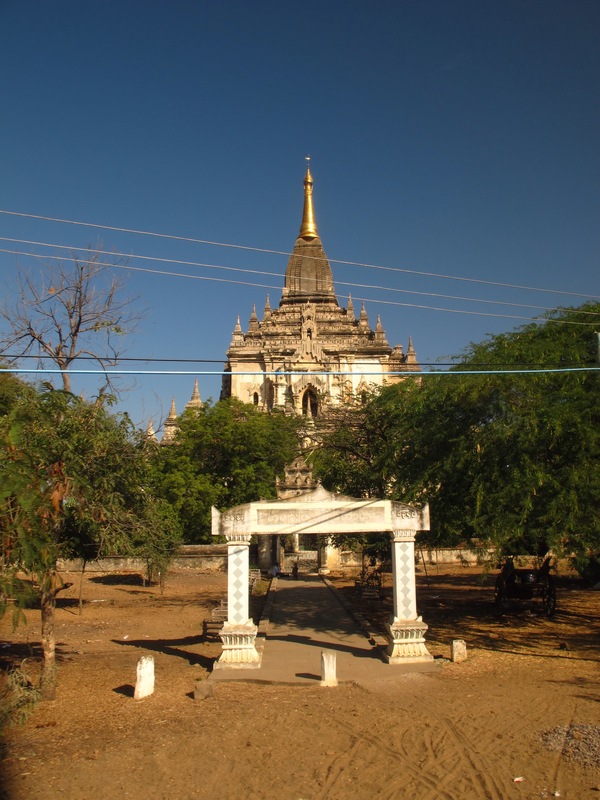 Stupas, Temples, Pagodas, Buddhas — too many to count! Time stood still here, indeed. 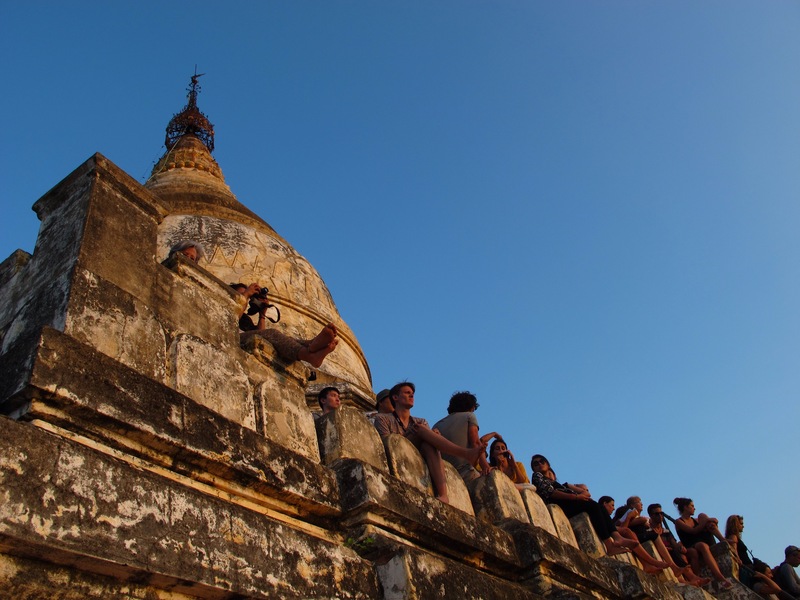 We braved and climbed the bigger 11th-century Shwe San Daw Pagoda where we waited for sunset. The Pagoda has 4 stairways on each side and we slowly and carefully scaled the steps towards each of the 4 (out of 5) terraces till we claimed a spot among some tripod-bearing photo enthusiasts. Now, I’ve waited for many sunset opps but for the life of me, I sensed that the sun took its time setting in this Burmese Plain. As we waited, a couple lit up their cigarettes and were gently reminded that they are on holy grounds. Some resistance there from the obnoxious pair, but seeing how many others were giving them killer stares, they relented. Back to the setting sun, I waited and snapped like the rest. Then, I happily stored my cam and simply watched the beautiful spectacle. When all’s over, I sneaked a peek into one of the serious photographers’ shots and felt how inferior and amateurish my photos were. But who cares? 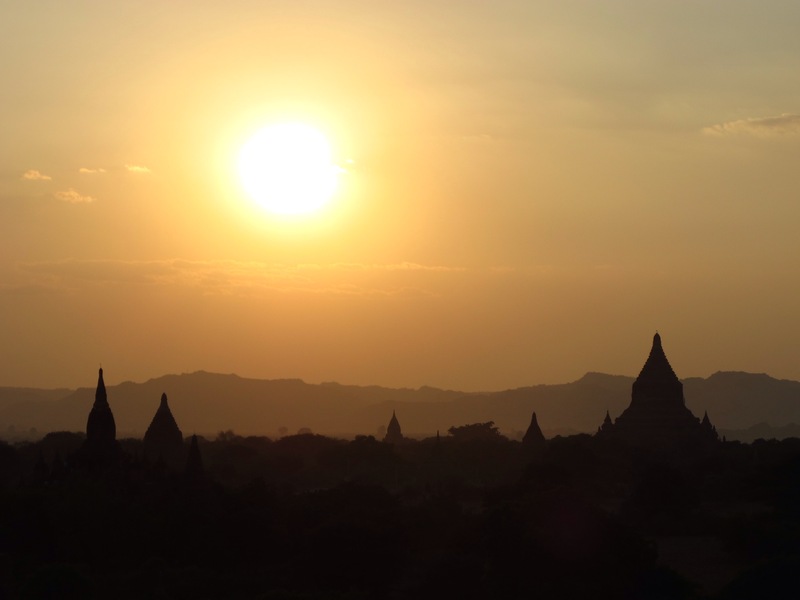 Sunset in Bagan is deeply etched in my memory, along with the sentimentality of a first-time visitor of this awesome landscape. Shwe San Daw Pagoda may not be the best monument for a sunset view, but judging by the number of pilgrims, tourists and shutterbugs littering the place, it must be among the best viewpoints. Lost in the frenzy of taking the best sunset shot is how this pagoda supposedly enshrines a Buddha hair relic. In fact, Shwe means “gold” and San Daw means hair. Just as lost are the terracotta plaques which once adorned the terraces of this magnificent pagoda. Like some other temples we’ve passed or visited, heavy-handed “restoration” nearly obliterated what used to be ancient architecture. A pity. But it happens everywhere in Third World countries with hardly any resources to preserve their links and expressions of ancient art and history. 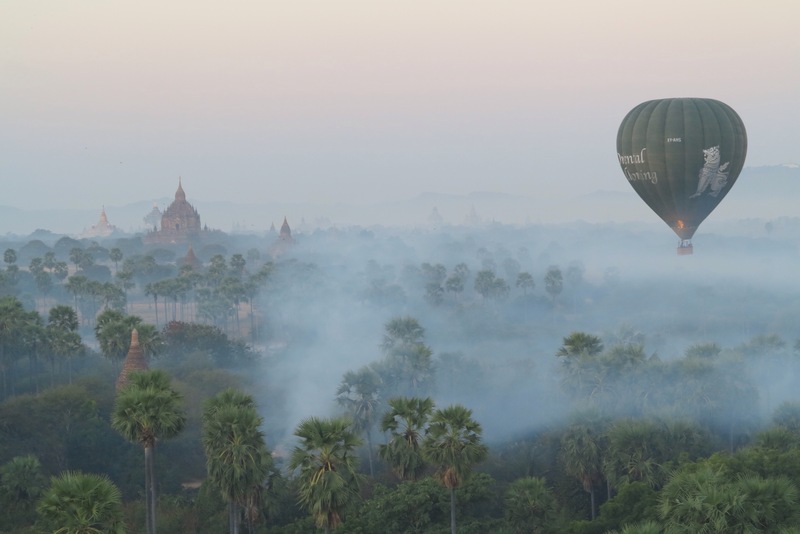 The early morning hot air balloon ride over this Plain must be a thrilling experience especially for first-time balloon riders. I borrowed and posted a photo here from someone (Thanks, Fe) who used a simple phone cam to capture the foggy scene. At ground level, there’s a choice between the horse cart and the oxcart. Either way, eat the dust, baby! I knew it even before I took the ride. As soon as I was handed a “surgeon’s mask” I prepped myself for a dusty hour. I would have wanted to ask someone to put some local sunscreen on my cheeks (called “thanaka”) but there was no chance. 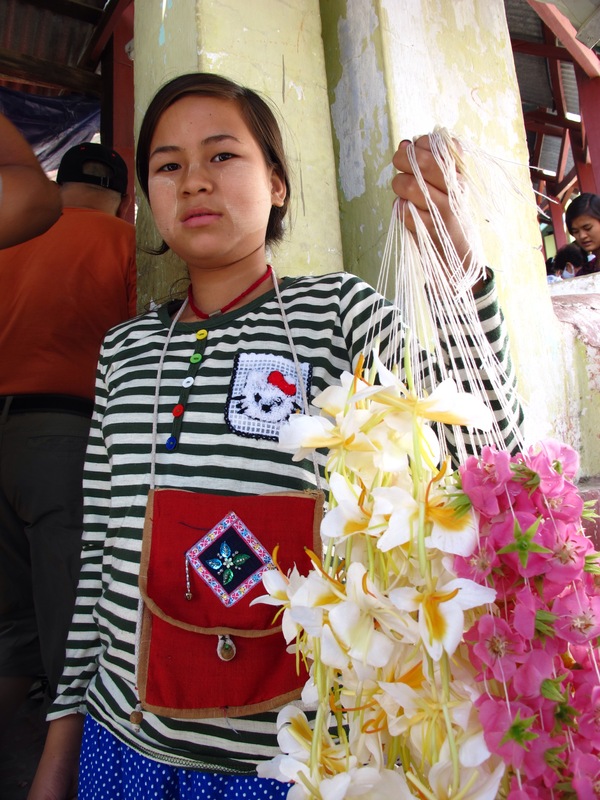 Thanaka is what you find on locals’s faces — you know, those whitish blotches on their faces which serve as sunscreen and cooling lotion. I had high expectations before coming here. Have not read much of its history, but viewed enough documentaries and NatGeo photos. 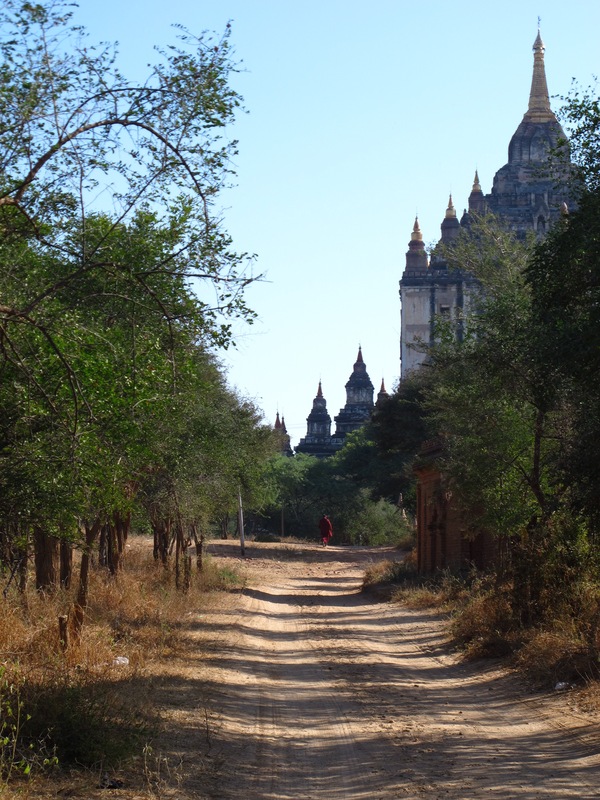 Still, Bagan did not disappoint. I do not know of any other place like it. 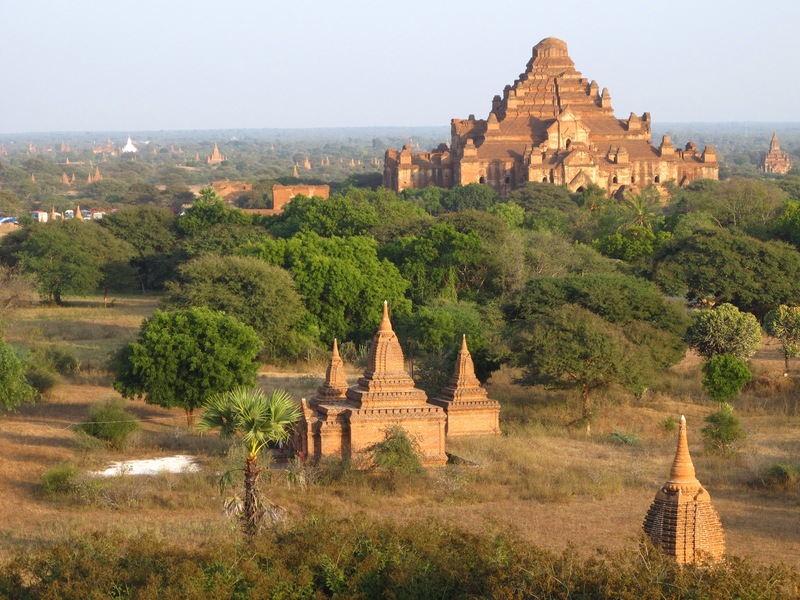 I can only imagine how prosperous Bagan was in the middle century to spark this frenzy of building imposing structures. As I mentioned, too many to count. Too many to care for. I won’t be surprised if some backpackers try to camp out in any one of the unguarded monuments on a humid summer night. 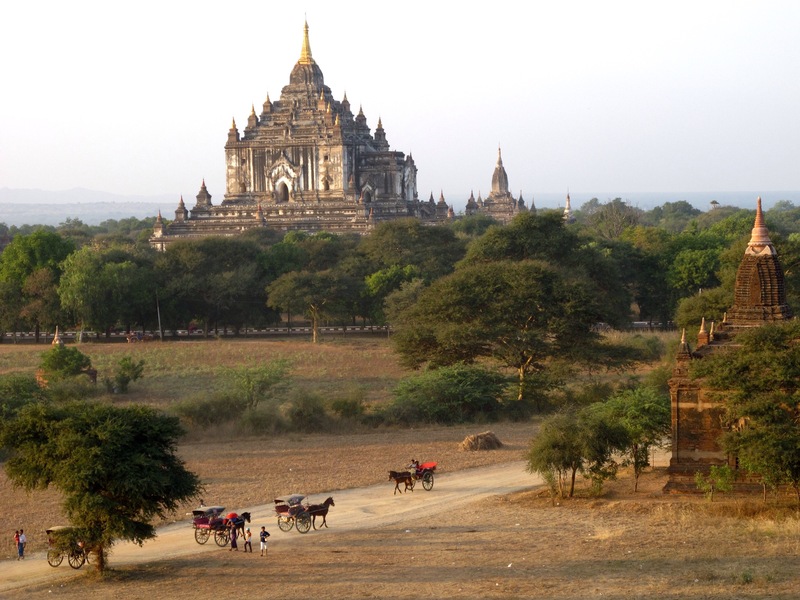 Oh Bagan. You’re a dream. Lara Croft should get here and do a movie sequel!